Well, so it’s a few days after Thanksgiving, and I’m just starting to get the hang of being anywhere other than the couch, and resuming less frantic feedings; right now (for instance), as I write this, my mouth is, at least relatively, unfull. I may possibly be getting to the end of the prolonged period of procrastination so many of us embrace at the back end of a holiday, where you feel like you live in a huge, slow, heavy house for big fatsos. We take Thanksiving very seriously here at Kelp Manor -in fact, it has always been our favorite holiday – and this year’s festivities were second to none. We ate everything we could get our pudgy little hands on, and then sloshed it down with the same horrendous swill I always lay in for my guests at holiday time. There’s nothing like buying some really cheap, awful wine, safe and secure in the knowledge that your victims will all be too ossified to know the difference. The trouble is, nowadays I look like this no matter what, and nobody knows the trouble I’ve seen voluntarily. 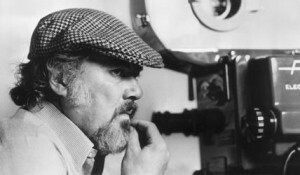 Which brings me around to something that’s very much on my mind the last few days, which is the loss of Robert Altman, one of history’s best and most iconoclastic directors, not to mention most lovable rogues. He made big, generation-defining movies like “M*A*S*H”, “Nashville”, “McCabe and Mrs. Miller”, and “The Player”; great experiments like “Short Cuts”, “Popeye”, “Gosford Park”, “The Company”, and “California Split”; even utter flops like “Quintet”. He earned the right to flop every now and then, because he was taking chances, doing anything other than making the same movie over and over again. For me, he’s on that short list of directors whose movies I always needed to devour instantly on release, regardless of the subject or the cast. Not that he was ever remotely cast-deficient; most of his films feature hilariously large and fascinating collections of the coolest actors playing the smallest parts for the lowest dough. If he won less than his share of awards, he made up for it in a steady avalanche of peer approval, and not just because he made good movies, but because making them was fun. He was prolific, creative, edgy, and funkily elegant throughout his life: the last movie he completed, a collaboration with Garrison Keillor called “The Prairie Home Companion”, is just as casual and funny and profound as anything he ever did, and, as usual, chockful of great actors (Lily Tomlin, Tommy Lee Jones, and especially Meryl Streep, all at their best.) Now that we’ve lost him (how could we be so careless? -first the Sagamore rotary, now Altman! ), it feels like a beautifully nuanced, lingering goodbye. Though frequently hilarious and joyful, the movie somehow also has the feeling of a friend holding your hand through a difficult time. Apparently, Altman knew he was dying of cancer when he made it, but kept it to himself- as he also did, amazingly enough, with a heart transplant he had more than a decade ago without anyone finding out about it until he mentioned it at an awards show about a year ago. He seems to have been a remarkably generous, non-meddlesome type (especially for a director! ), and one of the lucky by-products of this attitude (and of his apparently unflagging energy) is that he did director’s commentary tracks for a large number of his films, and they tend to be the exception to the rule in that he actually sounds engaged and focused, and the commentaries as a result are relatively informative and charming. “The Prairie Home Companion” hits the spot on that level, too, as Kevin Kline actually asks him some good, pertinant questions, and Altman has enough respect for his audience and his work to answer them graciously, and occasionally even seriously. He said some interesting things: he doesn’t necessarily read his scripts before he starts filming (didn’t on “Prairie Home Comapanion”, for instance); he’s also well-known for not being overly fussy with his actors, who seem to bask in the autonomy he routinely awards them. He seemed to place a particularly high value on finding the right collaborators and letting them loose. He seemed to have an uncommon respect for his audience, evinced by his fluid, flowing idiosyncratic camera work, which always had a feel and a rhythm that was all his own. In his last movie, the camera almost never stops moving; even on close-ups, it’s still in motion, albeit very slowly, sometimes almost undetectably. It’s a sort of amiable, relaxed drifting, and in the voice-over, he says that he always avoided telling the audience where to look. He also avoided telling them what to listen to, his patented overlapping dialogue a case very much in point. But he sure gave us some faulous choices! Usually, when someone dies, you’re sad for them and their family, but you get over it. Sometimes, though, a person is just plain irreplaceable, and you never stop thinking about them or missing them. For me, that list includes John Lennon, Andy Kaufman, a personal friend or two, and now, Robert Altman. There’ll never be another like him. This entry was tagged Andy Kaufman, drinking, holidays, John Lennon, Kelp Manor, Kevin Kline, Lily Tomlin, Meryl Streep, Robert Altman, Sagamore rotary, Thanksgiving. Bookmark the permalink.